Whisperer Robert Chaen (sitting at the head of table) with museum visitors from around the world. Although evidence is sketchy, the Hakkas are thought to originate (as early as 200 BC) from lands bordering the Huang River (Yellow River) or Shanxi, Henan, and Hubei Provinces (First Hakka Migration c. 311) of the Northern China of today. To escape calamity, Hakkas would later flee southward travelling through many lands. They eventually settled down in Jiangxi (Second Hakka Migration c. 960), Fujian (Third Hakka Migration c. 1125), and Guangdong Provinces. As they travelled south they became known by locals as “Hakka” or “guests”, thus the Hakkas appeared on the world stage for the first time in Malaya, Australia and U.S.A. (Fifth Hakka Migration c. 1850-1864). Opium smoking and resting on a hard “pillow” usually made of wood or iron where cash and valuables are kept literally inside the pillow. Robert’s Great Grandfather from his mother’s side in Penang smoked opium as it was the norm then. The Chinese Civilization started around 1600 BC. The Concubine system flourished as early as 265 AD for Chinese Emperors and the wealthy upper and middle classes. In the last two centuries, the Five Vices has become the practice of the Chinese diaspora community when the Chinese migrated to Hong Kong, Macau, South East Asia, Malaya, Singapore, and to Chinatowns in USA, Australia, and Europe. Women were selected as xiunu (elegant females) for the court as early as the Jin Dynasty (265-420 AD). Polygamy was common practice in feudal China, although only upper- and wealthy middle-class men could afford to take several wives. Wash basin with useful wall indentation for the feet. Location of Third Concubine Lane on the far foreground. The house toilet and its Fung Shui location is so important in Chinese culture that there is a famous Chinese saying “Sun See Hung” which literally means new toilet symbolizing one’s new house or apartment. Ipoh is the capital city of the state of Perak and is one of the biggest cities in Malaysia with over 750.000 inhabitants. 70% of Ipoh’s population is of Chinese origin. The city is located at a distance of approximately 200 kilometers to the north of Kuala Lumpur. From the North-South Expressway you can reach Ipoh within 2 hours by car. From Ipoh you can reach the island of Penang in 1.5 hours (150km). The city used to be the center of the tin industry (in the world); but those days are long gone. Nowadays the city still recovers from the important role it used to play; but it has much to offer to tourists. Ipoh is surrounded by beautiful limestone outcrops with wonderful cave temples; some of Malaysia’s biggest attractions are only a couple of hours away by car. Today’s Ipoh is well known for its excellent restaurants, hawkers, and famous local dishes. Because of this you will find famous ‘Ipoh cuisine’ hawkers at many places throughout Malaysia. Ipoh used to be one of the most important cities in the world as it was the center of the world’s tin industry. Nowadays the city is slowly developing into an important tourism destination. Nearby Ipoh you will find popular attractions. Cameron Highlands is only a short drive away. Also the beautiful island of Pangkor is located nearby Ipoh. Another gem is Royal Belum State Park. There so many beautiful sights in and around Ipoh that the state of Perak is trying to get Ipoh listed as World Heritage Site. 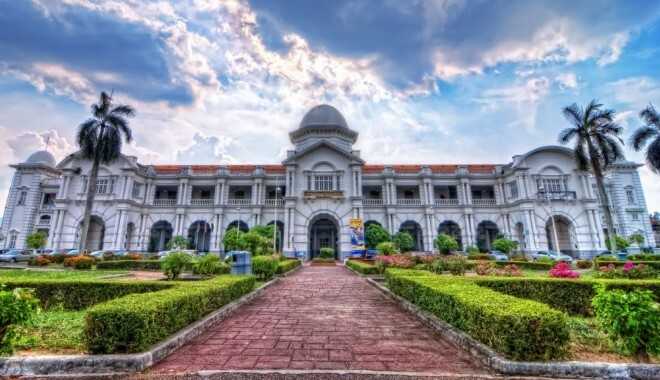 Ipoh has many nice attractions and sights in and around the city. One popular attraction is the Gunung Lang recreation park; where many locals spend their time to relax as it is just few kilometers away from the city center. The Lost World of Tambun Park is also a very popular attraction among locals and tourists. The city also houses beautiful architecture, such as the Railway Station, Town Hall and High Court. Other attractions are: Kinta River, Mariamman kovil temple, Ipoh Heritage Walk, Kellie’s Castle, Perak Cave with its numerous beautiful Buddha statues, Sam Poh Tong temple and the Kek Lok Tong temple. There are also numerous night markets at different locations throughout Ipoh; besides browsing for nice buys you can also buy snacks and food at the markets.